Love fudge, but think it takes too long to make? Well think again, because we're showing you how to make fudge the quickest and easiest way we know how! Traditionally fudge making is a long process, but we know a few shortcuts. For example, bypass the extra time and stress of using a candy thermometer by using marshmallows. You'll learn this and even more tricks when you watch this how to make fudge video. 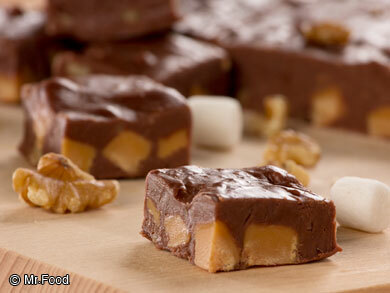 The best part about this quick fudge recipe is that you can customize it to your own taste! You can switch up the nuts, chocolate, and flavoring to make all kinds of yummy combinations. Making a sweet treat for special occasions will be a cinch when you know how to make fudge the easy way! Check out our video and tips on how to make fudge the easy way. Once you learn how simple it is, in no time at all, you'll be sayin', "OOH, IT'S SO GOOD! !®"
1. In a saucepan, heat sugar mixture and let simmer. Add evaporated milk, 1-2/3 cups sugar, and a pinch of salt to sauce pan and bring to simmer for about 5 minutes (until sugar is melted). 2. Line a 9- x 9-inch baking pan with aluminum foil. Lin the pan with foil and spray with cooking spray (or butter). This will allow for easy removal later. 3. Remove sugar mixture from heat and add remaining ingredients. Once sugar is fully melted, remove sauce pan from heat. Add 1-1/2 cups marshmallows, 1 cup semi-sweet chocolate chips, a little vanilla extract, and nuts of any kind (macadamia, cashew, almonds, etc...). 4. Stir until ingredients are melted. Heat from the milk and sugar mixture will melt the added ingredients. Tip: Smaller marshmallows will melt faster than larger ones. 5. Pour mixture into pan and refrigerate. Once fudge mixture is fully incorporated, pour into foil lined pan, even it off, and place in fridge to firm up. 6. Cut, serve, and enjoy. Once fudge is firm, remove from fridge, use the foil to lift fudge from pan, cut into squares, serve and enjoy! 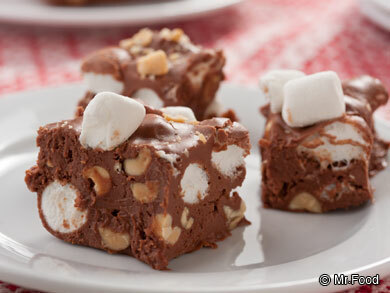 Check out this fudge recipe for Rocky Road Fudge. Now that you know how to make shortcut fudge, why don't you check out some of our favorite fudgy recipes? We'll even tell you How to Make Chocolate Candy with 12 easy recipes! 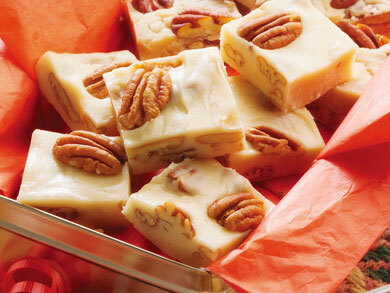 Download our free eCookbook for even more homemade fudge and candy recipes! How do I adapt recipe for high altitude? We are at 7000 feet. Thanks! Love the videos D I have bookmarked this site!